Analysis: Flowers agreed to a five-year deal that can pay him up to $90 million, according to Dave Birkett of the Detroit Free Press reports. The $18 million average annual value is not only more than what Flowers could have made on the franchise tag, but it also makes him the fifth-highest paid defender in the league -- while signaling Detroit's total confidence that Flowers won't have any long-term ramifications from the shoulder surgery he underwent this offseason. Analysis: Flowers is set to be a free agent this offseason and it doesn't appear his surgery will turn teams away. He underwent what was primarily a clean-up procedure, addressing an issue that isn't considered serious. While the injury isn't expected to impact him once training camp rolls around, it's unclear if he'll be a full participant in offseason workouts. Analysis: Flowers' numbers have put him on the radar in deeper IDP formats over the last three seasons and the 25-year-old is now eligible to become a free agent this offseason. We'd expect the Patriots to try to retain the 2015 fourth-rounder, but other teams may offer the defensive end more than New England is comfortable paying. 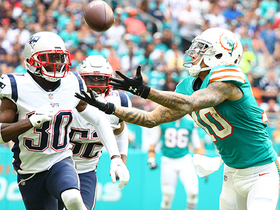 Analysis: The Patriots pressured Ryan Tannehill all day, accumulating five total sacks, two of which came from Flowers. He also jarred the ball loose from Frank Gore, though Miami ultimately recovered the fumble. The fourth-year defensive end has 6.5 sacks on the season, including four in the past three games. Flowers logged two tackles (one solo) and one sack during Sunday's 24-10 win over the Vikings. Analysis: Flowers took down Kirk Cousins during the Week 13 win, bringing his sack total up to 4.5 on the season. The 25-year-old has posted a sack in two consecutive games and will look to log another strong outing against the Dolphins in Week 14. Flowers doesn't have an injury designation for Sunday game against the Vikings. Analysis: Flowers was absent at Friday's practice, but it wasn't an injury issue or anything that threatens his status for Sunday's game. The 25-year-old should therefore fill his usual starting spot at defensive end for the Patriots. Flowers wasn't visible during the portion of Friday's practice available to the media, Mike Reiss of ESPN.com reports. Analysis: Flowers wasn't listed on the injury report Wednesday or Thursday, so it remains unclear whether this is an injury situation or something else. The 25-year-old's status should be cleared up later Friday when the Patriots release their final injury report for Sunday's game against the Vikings. Flowers posted two tackles and a sack in Sunday's 27-13 win over the Jets. Analysis: Flowers managed to take down Josh McCown, bringing his sack total to 3.5 on the year and logging his first full sack since Week 1. He'll look to keep it going against the Vikings on in Week 13. Flowers recorded five tackles (two solo) and 0.5 sacks across 72 defensive snaps in Sunday's win over the Packers. Analysis: Flowers reached the quarterback for the first time since Week 1. His 72 defensive reps were a season high, as he stayed on the field for 97 percent of the Patriots' defensive plays. Flowers posted six tackles and one pass defense during Monday's 25-6 win over the Bills. Analysis: Flowers' six tackles were his second-highest total of the season. The fourth-year defensive end has 27 tackles on the season, but hasn't compiled a sack since Oct. 24 when he registered 0.5 sacks. He'll look to get back in that column on Sunday night against the Packers. Flowers recorded seven tackles (two solo) in Sunday's win over Kansas City. Analysis: Flowers' seven tackles were a season high. He's on pace for the lowest sack numbers of his career through six games, but he has time to turn that around. He and the Patriots will take on the Bears next Sunday. Flowers (concussion) is active for Sunday's contest against the Dolphins, Jeff Howe of The Athletic reports. Analysis: Flowers sat out last week after suffering a concussion against the Jaguars in Week 2. He'll return to his role as a starting defensive end as New England looks to take down the undefeated Dolphins. Flowers (concussion) is expected to play Sunday versus the Dolphins, Michael Giardi of NFL Network reports. Analysis: Flowers missed Week 3's contest as the Patriots got worked by the Lions. The fourth-year pro will look to add a sizable pass rush after already making 1.5 sacks through two games. Flowers will have a solid matchup, too, since Miami's offensive line is ranked 20th in the league according to Pro Football Focus. Flowers (concussion) is questionable for Sunday's game against the Dolphins, Zack Cox of NESN.com reports. Analysis: Flowers suffered a concussion during New England's Week 2 loss to Jacksonville and continues to progress in his recovery. If the team's top pass rusher remains sidelined for his second consecutive game, expect Deatrich Wise and Derek Rivers to once again see increased defensive roles. Flowers (concussion) was a limited participant in Wednesday's practice. Analysis: Flowers continues to nurse a concussion sustained during New England's Week 2 loss to the Jaguars. If Flowers is unable to clear the concussion protocol in time to suit up against the Dolphins on Sunday, Deatrich Wise and Derek Rivers will once again attempt to replace the team's top pass rusher. Flowers (concussion) is out for Sunday's game against the Lions, Kevin Duffy of MassLive.com reports. Analysis: Flowers suffered a concussion during the Patriots' Week 2 loss to the Jaguars. While he's unavailable, Deatrich Wise and Derek Rivers should see expanded roles. 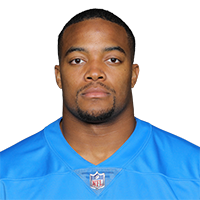 Flowers (concussion) is listed as doubtful for Sunday's game against the Lions. Analysis: Flowers suffered a concussion in the Patriots' Week 2 loss to the Jaguars. Barring a quick recovery it does not look likely that he will be able to suit up Sunday. Deatrich Wise and Derek Rivers could be in line for increased roles should he ultimately sit out. Flowers (concussion) didn't practice Wednesday. Analysis: Flowers suffered a concussion in the Patriots' Week 2 loss to Jacksonville and has yet to return to practice. The team's top pass rusher, Flowers will have only a few days to clear the NFL's five-step concussion protocol before the Patriots return to action Sunday against the Lions. If Flowers misses any time, expect Deatrich Wise (finger) to once again serve as his primary replacement. Flowers (concussion) will not return to Sunday's matchup against the Jaguars after suffering a concussion. Analysis: Flowers suffered a concussion during the first quarter of Sunday's matchup and was replaced by backup defensive end Deatrich Wise. New England's top pass rusher will not return against Jacksonville but will look to clear the league's concussion protocol in time to suit up Week 3. Flowers exited Sunday's game against the Jaguars and is being evaluated for a concussion. Analysis: Flowers was forced out of Sunday's contest in the first quarter. Deatrich Wise will serve as the Patriots' starting left defensive end as long as Flowers, the team's top pass rusher, remains sidelined. If Flowers is unable to return to the field Sunday, expect an update on his injury shortly after the game. Flowers notched five tackles, including 1.5 sacks, in Sunday's 27-20 win over the Texans. 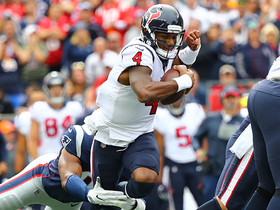 Analysis: Flowers and the Patriots' defense came out strong against Houston on Sunday. Flowers has totaled 13.5 sacks over the past two seasons, and his performance in Week 1 puts him on track for another quality campaign. He'll look to keep his momentum rolling in a Week 2 AFC championship game rematch against the Jaguars. Flowers (undisclosed) does not appear on the injury report ahead of Sunday's game against the Texans. Analysis: Flowers didn't see any action during the preseason for an undisclosed reason, but his absence from the injury report suggests the defensive end is fine and ready to go for this weekend's regular-season opener. Flowers received three stitches on his forehead after suffering a facial laceration during Friday's practice, Zack Cox of NESN.com reports. Analysis: Flowers suffered the injury during a pile-up on the goal line. He was subsequently limited at Saturday's practice, but the issue is considered minor. Look for him to resume a full workload once his stitches are removed. The defensive end is coming off a career-high 804 snaps last season, which resulted in 62 tackles (45 solo) and 6.5 sacks. He will presumably be in line for another starting role in 2019 assuming he avoids any setbacks. Flowers departed Saturday's practice early with the training staff and a towel to his face, NESN Sports reports. Analysis: The extent of Flowers' injury has yet to be revealed, so it's best to consider him day-to-day until something suggests otherwise. The defensive end played a career-high 804 snaps on defense last season, recording 62 tackles (45 solo) and 6.5 sacks and should serve as a starter again in 2018 assuming the issue doesn't force him to miss extended time. Flowers finished the 2017 regular season with 62 tackles and a team-high 6.5 sacks in 14 games to go along with two forced fumbles. Analysis: Given his defensive line eligibility, Flowers has carved out some utility in IDP formats in his role as the team's starting right defensive end. It's an assignment the 2015 fourth-rounder should reprise in 2018, the final year of his rookie deal with the Patriots. Flowers (ribs) is officially active for Sunday's game against the Steelers. Analysis: Flowers was listed as questionable after sitting out the last the two weeks. The Patriots sack leader returns for the Sunday's matchup with the Steelers atop the AFC. The Patriots have deemed Flowers (ribs) as questionable for Sunday's contest against the Steelers. Analysis: Flowers logged three consecutive limited practices this week after missing the previous two games with a rib injury. Final confirmation on his status for Week 14 will likely be determined prior to kickoff. Either Eric Lee (ankle) or Geneo Grissom would figure to replace Flowers should he ultimately be unable to return. Flowers (ribs) is officially inactive for Monday night's game against the Dolphins. Analysis: Flowers was a limited participant in practice all week and was listed as questionable, but he will miss his second consecutive game. 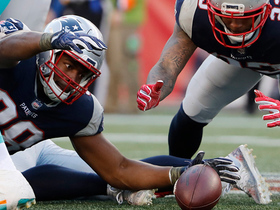 The 24-year-old leads the Patriots with six sacks on the season, and the team will have to look beyond the usual suspects for production with leading tackler Kyle Van Noy (calf) also inactive Monday. Flowers (ribs) is questionable for Monday's game against Miami. Analysis: Although he's listed as questionable, Flowers was able to practice all week, which indicates he might be able to return to the field Monday. He's one of the team's top defenders and a versatile disruptor in the front seven. Flowers (ribs) has been downgraded to out for Sunday's game in Buffalo, Ben Volin of The Boston Globe reports. Analysis: The Patriots did some roster shuffling Saturday with this in mind. While Bill Belichick always seems to figure out a better way against the Bills, the Pats will now be without their best pass rusher and will have to pinpoint some alternative means of getting pressure on Tyrod Taylor. Flowers (ribs) is listed as questionable for Sunday's game against the Bills. Analysis: Flowers was a limited participant in practice this week, so it remains unclear how likely he is to play. Eric Lee or Ricky Jean-Francois are candidates for additional playing time should Flowers be unable to suit up Sunday. Flowers (ribs) was a limited participant in Wednesday's practice. Analysis: It's a good sign that Flowers was able to get on the practice field just three days after suffering a rib injury. However, the nature and severity of this injury aren't clear, and more about his availability for Sunday's game against the Bills will surface after Friday's practice. Flowers suffered a rib injury against the Dolphins on Sunday and is questionable to return. Analysis: Flowers has had a productive day Sunday before leaving, recording four tackles -- two sacks and two tackles for loss. Until he's able to return, Eric Lee, who was just signed Tuesday, will see an increase in defensive snaps. 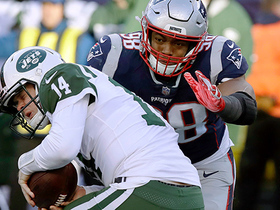 New England Patriots recover fumble after defensive end Trey Flowers punches ball from New York Jets running back Elijah McGuire. 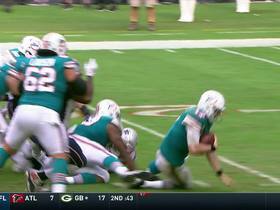 Miami Dolphins quarterback Ryan Tannehill gets stepped on by his offensive lineman and is slow to get up. 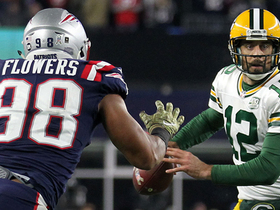 New England Patriots Adrian Clayborn and Trey Flowers collapse on Green Bay Packers quarterback Aaron Rodgers for key sack. 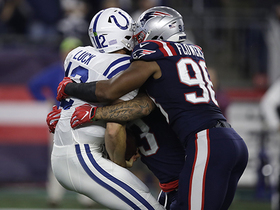 Two New England Patriots defenders, defensive lineman Trey Flowers and safety Patrick Chung, sack Indianapolis Colts quarterback Andrew Luck for 10 yards in Week 5. The entire New England Patriots defensive line is able to burst through the Houston Texans offensive line to take down quarterback Deshaun Watson for a sack. 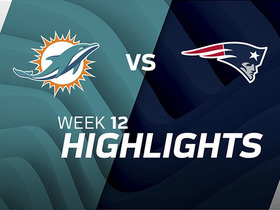 Watch as the Miami Dolphins take on the New England Patriots in Week 12. 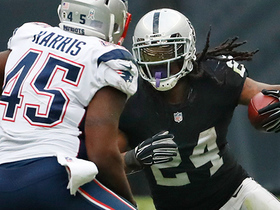 Derek Carr improvises, recovers from trip and gets ball to Marshawn Lynch, who picks up first down.